The Federal Aviation Administration (FAA) is solely responsible for the control of aircraft traffic (Air Traffic Control-ATC) inside the U.S. National Airspace System (NAS); see the FAA's Air Traffic website. Standard Terminal Arrival Routes (STARs) and Standard Instrument Departures (SIDs) are designed for many airports in the NAS. These are standard paths in the air that provide increased safety. Each major airport maintains a control tower which houses air traffic controllers who monitor all aircraft taxiing, taking off and landing at that airport. The tower controllers are responsible for the airspace up to 3,000 feet above the airport and a radius of five miles around the airport. Tower controllers have three different positions through which each rotate during their shift assignment: clearance delivery, ground control and local control. Local Air Traffic Controllers are people in the control towers who make sure that air traffic flows safely and efficiently. They line up aircraft with safe spacing for landing and schedule safely spaced departures between landings. The task of keeping aircraft at safe distances from one another is called separation. The size of separation depends on the size and speed of aircraft and the amount of turbulence caused by the aircraft. Air traffic controllers must consider vertical, horizontal, and lateral distances between all aircraft. Weather conditions and the amount of traffic in the local airspace also influence how often control	lers can schedule takeoffs and landings. Each airport has a designated Airport Acceptance Rate. It tells air traffic controllers the maximum number of arriving flights that an airport can accept on an excellent weather day. Air traffic controllers must adjust this number for weather and traffic volume. Weather: Each airport must adjust which departure and arrival procedures it uses depending on wind patterns and other weather concerns. California has many Military Operation Areas (MOAs) that restrict traffic patterns, and is also limited by mountains. Florida has MOAs off the coast, so air traffic controllers must direct all air traffic up and down the center of the state. This creates dense, complicated traffic, and limits flexibility. The East Coast, because of its limited airspace and large number of airports, is also limited in its flexibility. Therefore, flights always travel to and from these airports in similar patterns. These facilities control aircraft in the same way as the local controllers, by safely spacing flights. In some parts of the United States, these facilities and local control are combined into one entity. However, some larger airports need two separate facilities in order to ensure that safety is maximized. For example, Chicago has a TRACON in an area outside the city. It makes sure that O'Hare International Airport receives properly spaced aircraft. These controllers continue to space the aircraft at set distances. They also have the important task of either decreasing or increasing an aircraft's altitude. These facilities are made up of enroute controllers. They manage the "cruise traffic" between the local or terminal controls. They can also control traffic into and out of airports that have small traffic volume and do not have the resources to establish a terminal air traffic control operation. Controllers adhere to a set of separation standards that define the minimum distance allowed between aircraft. These distances vary depending on the equipment and procedures used in providing these services. Pilots have the option of flying under this set of rules when operations are conducted at a sufficient distance away from clouds (where there is sufficient visibility). Pilots are not required to file flight plans for these flights, although it is highly recommended. Pilots operating over metropolitan areas must have a working transponder that sends a signal to Air Traffic Control. This signal tells the controller where the aircraft is operating. Pilots flying noncommercial operations are more likely to operate under these rules. Pilots can fly under this set of rules with or without sufficient visibility. Pilots are required to file flight plans when operating under this set of rules. Pilots must also have working transponders and travel on routes assigned by Air Traffic Control. 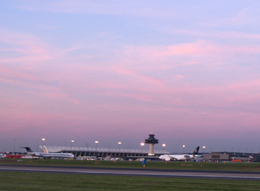 Air Traffic Control provides information to pilots about their closeness to other aircraft. Also, sophisticated instrumentation used during these flights provides added safety benefits. An approaching aircraft can be aligned with the centerline of the designated landing runway several miles out. For more information about flight and air traffic control requirements, please see the FAA's Air Traffic website.